Eric Winer travels the world, from Athens to Silicon Valley—and back through history, too—to show how creative genius flourishes in specific places at specific times. “Mr. Weiner is a prober and questioner, a big-hearted humanist who will always take a colorful, contradictory reality over some unfounded certainty...The Geography of Genius is useful less for any lessons about how to cultivate genius than for its suggestion that genius flowers in those areas a society considers most important. Taken as travel writing, the book is a witty, entertaining romp. Weiner’s vivid descriptions of modern-day life in each locale make the spots feel like must-­visit destinations...People expecting a meaty exploration of genius as a concept, however, will most likely come away unsatisfied. Weiner is a superb travel guide: funny, knowledgeable, self-deprecating...If there is a pervasive weakness in this book, it’s that Weiner’s observations on genius are sprinkled through the narrative so freely, and so constantly, that readers may struggle to synthesize them and take in their contradictions. 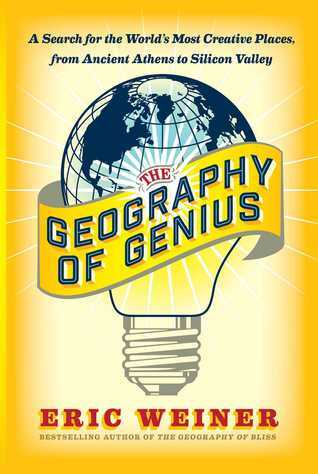 What did you think of The Geography of Genius: A Search for the World's Most Creative Places from Ancient Athens to Silicon Valley?